Barges? We don't need no steenkin' barges! I received a note from John Ott today that the drawing he was working on for me is ready. In case you don't know of his work, please check out his website at this link. His modeling and layouts are superb. My favorite is his latest layout project, the Miskatonic Railroad. It's a late 19th century railroad set in Arkham, Massachusetts a fictional town invented by H. P. Lovecraft. The craftsmanship is splendid, but the story that layout tells is also marvelous. It is as creepy and exotic as the inspiring author's stories. I am not a big Lovecraft devotee, but I love John's layout. The rest of his website is chock full of wonderful graphics and modeling. I would nominate it for "best model railroad website award " if such an award existed. One of the neat graphics projects John has been doing is making drawings of early rail locomotives in style similar to original builders prints. His drawings are exhaustively researched and expertly rendered. I have one hanging in my stairwell as you enter my layout. A few months ago, John published a new print of a Baldwin flexible beam locomotive. In seeing it, I asked if John could do a version decorated for the USMRR Washington, which I have previously discussed on this blog here and here. John agreed, but demurred until he could accurately research it. So I asked some of my friends that are early rail and locomotive experts if they had any insight into the USMRR Washington. Nick Fry, who is Curator of the John W. Barriger III National Railroad Library and The Baltimore & Ohio Railroad Historical Society Vice President of Operations, found some very useful information. John, using the information, came up with this sketch. I'll let John describe his thought process in making the drawing. I attached a drawing here (as well as the inline drawings later in the note). Thought you might like to see progress on the USMRR Washington we discussed a while back. Although a lot of it is speculative, I think we're on our way to having something that looks probable, if not absolutely accurate. Until a photo turns up, I think this is a reasonable rendering based on good assumptions. Per Nick Fry's recommendation, I started with the drawing of the Reading sister engine, Kentucky. Used those dimensions and layout of the engine components. Since sixteen years passed between the Washington's delivery date and its acquisition by the USMRR, I added the things that the Reading would have added in the meantime. 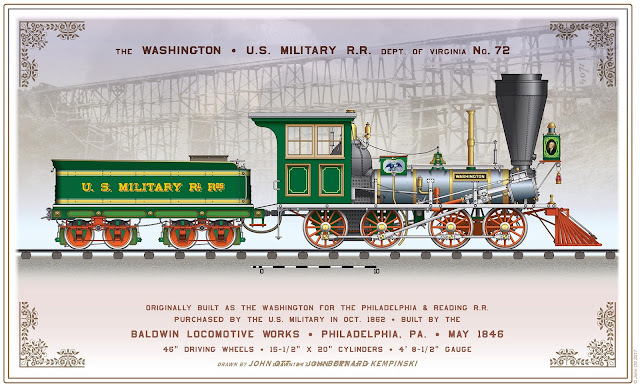 There's no indication in the Reading roster that the Washington was ever rebuilt, so these would be fairly minor additions: cab, sandbox, second safety valve, headlamp, and cowcatcher. I copied these components from drawings of uprated Baldwin flex-beams in my Pennsylvania RR reference collection. The original components are all still there, including the A-frame bell bracket. 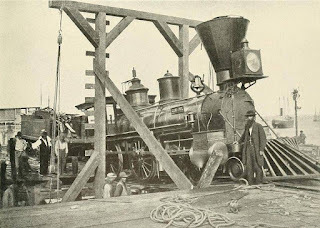 I considered swapping out the V-hook valve gear for link-motion, since that was a common upgrade, but that usually happened during rebuilds, which apparently the Washington never got. So I kept the V-hooks. 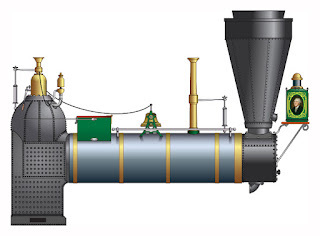 From the looks of the Kentucky drawing, the engine didn't have an independent cutoff like the Pennsylvania engines. That's actually good news. Simpler to model, that way. The two-tone frame paint job was stolen from Iron City lithograph. 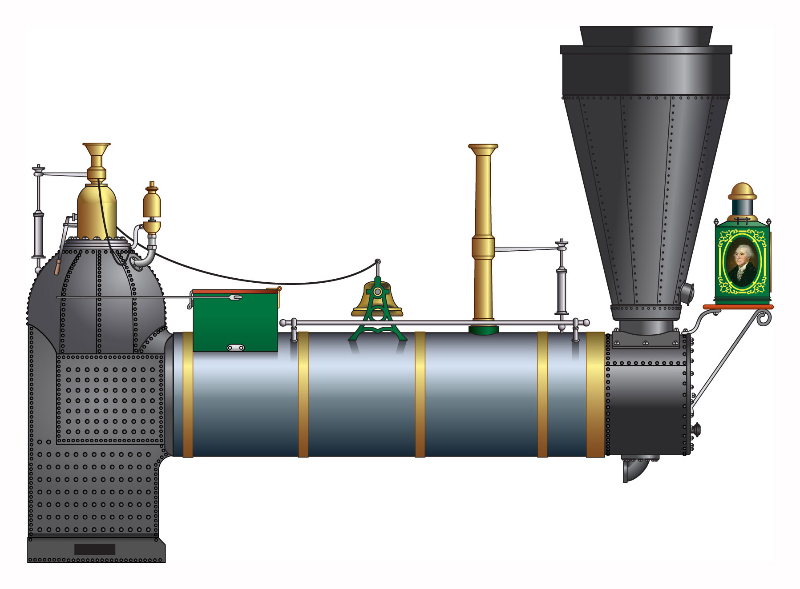 I was able to reuse a drawing of a Bury boiler I had from a rendering of another Baldwin engine built about the same time as the Washington. Same general boiler dimensions. The second safety valve, in its tall cannon, seems to have been standard on the Reading. I added a whistle to the haystack dome. This was another usual placement. I kept the same stack as the Kentucky. The headlamp bracket is kind of generic. The headlamp is a style I've seen on several other USMRR locos, like the Haupt. When you get to the cylinders and crossheads, notice how the water pump shaft is attached. The crosshead guide was a single triangular shaft, not the usual four-bar arrangement. The main rod attached outboard of the side rods. I gave the machine a standard 1850s Baldwin 8-wheel tender, because I think that's what it would have ended up with by 1862. The original 6-wheel tender probably wouldn't have lasted. Finally, I gave the Washington a paint job that I think was probably typical for USMRR engines. The paint jobs ran from overly simple to extravagant, based on some criteria I don't understand. (Other than the fact that the commanding officers got engines with elaborate decoration schemes.) Bronze green with vermillion wheels was kind of a default color treatment. The Washington has simple tender stripes and panels plus Egyptian block lettering (taken from an 1850s sign painters guide) with two levels of shading. For special decor, I added a portrait of Old George to the headlamp and a patriotic "e pluribus unum" eagle to the sandbox. Nothing that would have seemed out-of-the-ordinary for an engine in that era. 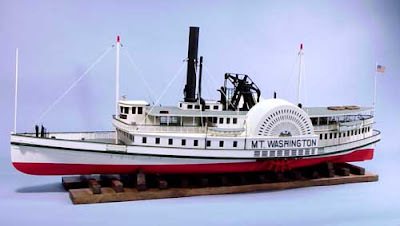 So-- here's the Washington, as I imagine it straight from the USMRR Alexandria paint shop, ready to go to Aquia Landing and glory. As a final treat. I suggested to John that he add a background appropriate for Aquia Landing. He presented me with four options. I selected the bean-pole trestle, as that is the bridge that Herman Haupt used Washington as a test load. The only drawback is now I need to find a place to hang this print in my already full walls. 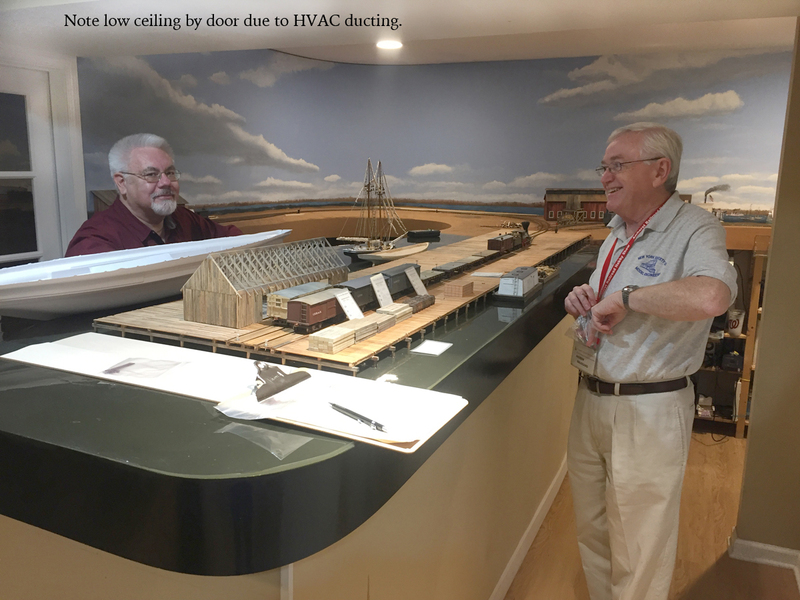 One of the great things about model railroading is the spirit of cooperation and generosity of many of the participants. John and the sharing of his art work is a quintessential example of such munificence. This was a landmark year for my model railroad layouts. The highlight was that we started operations on the Aquia Line while also operating PoLA. So far we have had five op sessions on the Aquia Line, and 12 on PoLA. Operations on both have proved satisfying. The layouts really come alive in op sessions. When I was building the Aquia Line I had a nagging fear that the operations on that layout would be dull. But I was pleasantly surprised when those fears proved unwarranted. Adding two simultaneous trains, and running extras or general's specials made the Aquia Line fun to operate. 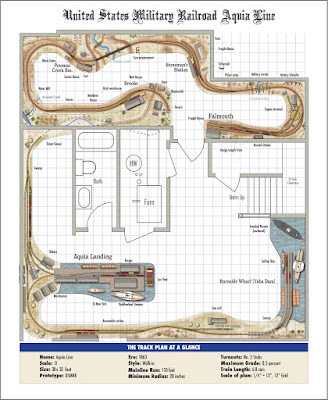 My advice to people considering a layout is to not overlook the possibilities of a simple track plan for a branch or lightly used main line. I opted for a simplified design for Burnside wharf, mostly because I felt the planned design with a wharf in a 12 inch wide space was too cramped. The modified plan is working out well in operations sessions. 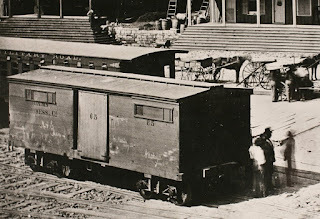 Yes, those are not civil war era box cars. You'll see why later. If I decide to go with expansion plan 18, I'll have plenty of room to do a nice rendition of Burnside Wharf. To prepare for operation sessions I added more freight cars to expand the fleet by about 50 percent. These included two conductors cars, one of which won a first place prize at the regional NMRA meet in Harrisburg, PA.
As for locomotives, the new Stanton battery system with the updated battery charger system has proven to be perfect for operations. With operations under way, I began to work on the ships, barges, and structures for Aquia Landing. The most notable accomplishments in that regard were completing the car float barges and the transfer bridge ramps. The floats and ramps are operational and almost completely detailed. 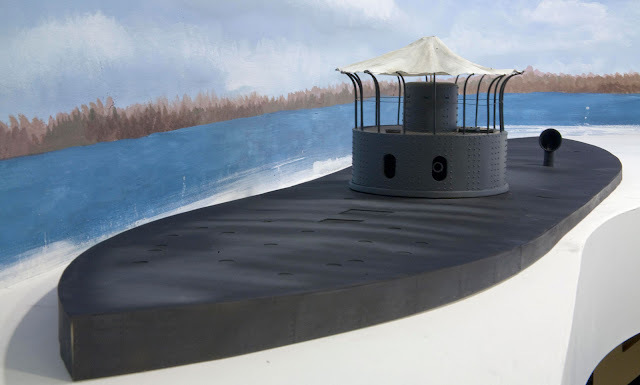 Among the ships, the highlight was the paddlewheel steamer, which, after seven years, I finally made good progress on by cutting the hull to the waterline and installing the main deck. There is still a lot to do on that ship, but at least it is underway. The op sessions have shown that the Falmouth area is cramped. The tight curve there also causes problems every now and then. So any expansion plan really need to address those issues. With regard to expansion, I am considering lots of ideas. One of the other dilemmas I have is what to do with the Passaic ironclad model. I built it a few years back. I really enjoyed the process. But with the hull nearly complete and the model placed on the layout, I realized it was going to be too big and really didn't belong here. However, my guests love it and say it really sets the time and place of the layout. So perhaps it will fit in a future Burnside Wharf expansion. 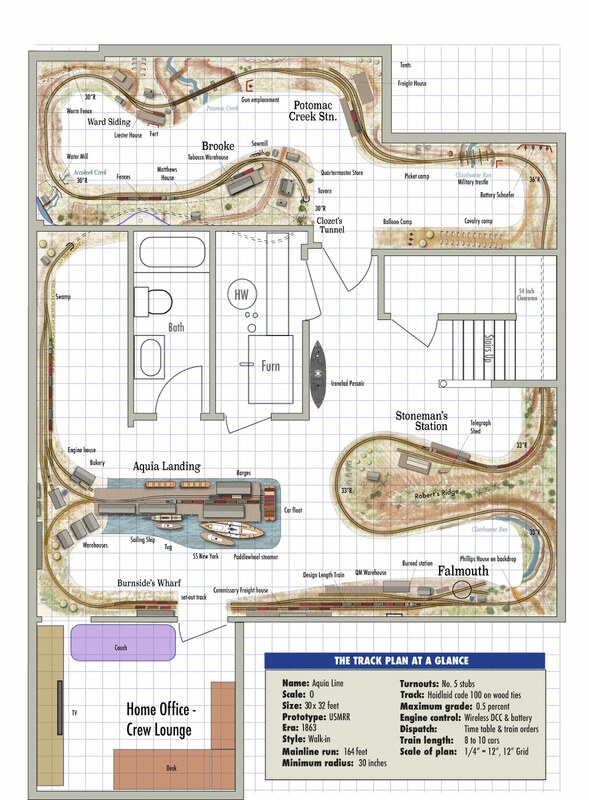 Alternatively, I could rebuild it as a pond model and try it out as a radio controlled model. That might be fun. I have also been doing some expansion work on PoLA in parallel with the work on the Aquia Line. PoLA has proven very popular with operators and visitors. The introductory video has over 139,000 views. I really enjoy researched and building it. It is also an excellent test bed for new Alkem Scale Models products. Nonetheless, I am now planning on dismantling it, and either selling it or converting it to modules. One of the main reasons for that is the difficulties I experienced with DCC and the modern sound equipped diesels as I documented here. That has proven to be an unexpected pain-in-the-petunias. On the Aquia Line, I have 5 DCC equipped engines and all run pretty well, knock on wood. That is about as much DCC angst as I want. Another highlight of this year was the completion of a 1/32nd scale submarine chaser model for the Lyceum, Alexandria City's History Museum. It was a short deadline project for their WWI exhibit. Building ship models is fun, but I find layout design and construction to be a much more intellectually rewarding and challenging hobby. 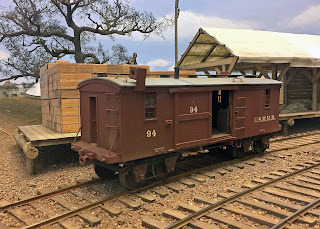 I also built model of a unique coal dock for Mike Burgett this year. I really enjoy building custom models for museums and clients. If you have a need for a custom model, please contact me to see if I can build it for you. 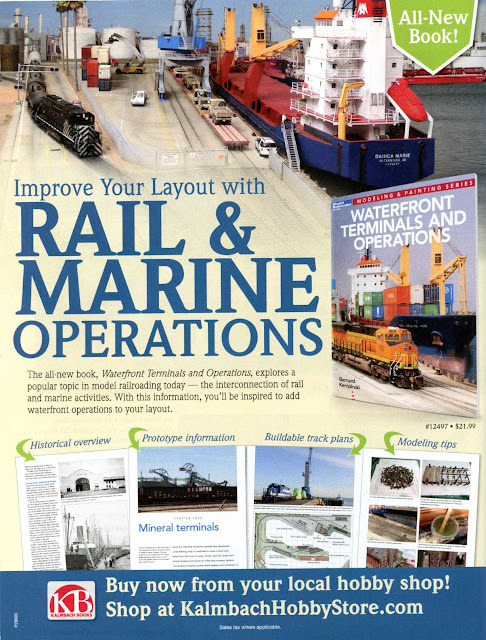 Kalmbach published my fifth book for them on waterfront terminals and operations. It is available for sale from Kalmbach, Amazon, and at hobby shops. You can get a signed copy from the Alkem Scale Models website. It was also another busy year of public speaking. I presented model railroad talks in Annandale, VA, Fairfax Station, Va, Tulsa, OK (where I was the keynote speaker), Harrisburg, Pennsylvania, Collinsville, IL, and Rochester, MN. But the best was the "father's toast" to my daughter and son-in-law at their wedding in Aspen, CO.
We also had dozens of visitors from as far away as Australia, California, Kansas, Texas, Louisiana and many other east coast states. We also had lots of children visit the layout, most of whom got some throttle time. We also had a couple great work sessions as my friends helped prep the layout for operations. All in all a great year. Let's hope 2018 is as productive. We are back in Virginia after a Christmas trip to Rochester, Minnesota to visit relatives. It was very cold there, but we had a good time and had a chance to do a little bit of rail-fanning. I received a couple interesting books for Christmas as gifts. The first was "Grant," by Ron Chernow. It is getting good reviews. The second is, "Clad in Iron - The American Civil War and the Challenge of British Naval Power," by Howard Fuller. A quick skim of the chapters definitely caught my interest. I will read that next after I finish George Swede's, "The Steam Tug." So far that book has been a fascinating review of the history of the steam ships and tugs. This evening we were visited by Nick Pautler and his parents from Delaware. They are all rail fans and are planning on building a new layout. Nick is an engineering college student so doesn't have much time for model trains now. But his dad is building a new house with lots of room for a new layout. They are interested in coming back for an op session, so we will add them to the call board. While in Minnesota I tweaked the Aquia Line v18 design a bit. The main change to the plan was that I moved the turntable to the back of the Falmouth section, thereby making the benchwork in that area narrower. 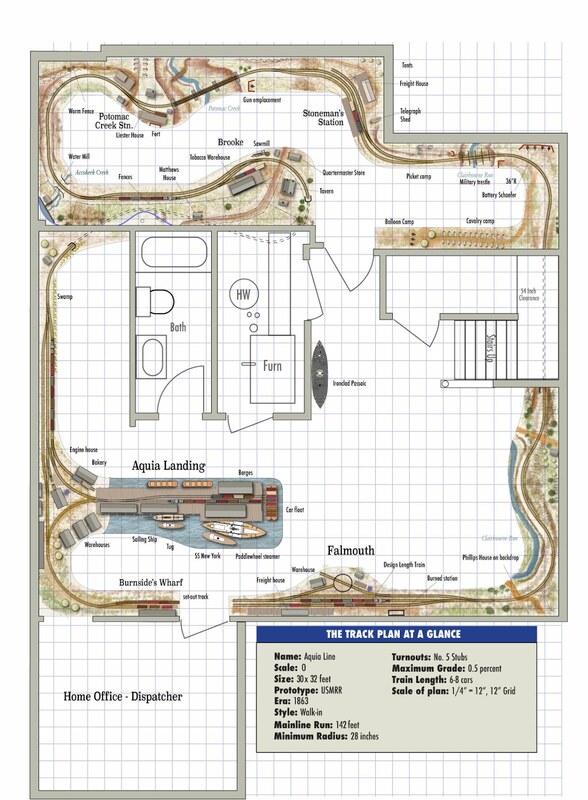 That will allow me to keep the couch in that part of the layout for use as a crew lounge and TV viewing area. The couch can slide under the Falmouth benchwork during an op session. A by product of that change is that the continuous run (CR) is eliminated because there was no way to fit it behind the turntable in a convincing manner. As I have said in the past, a CR is not a priority for me, so it's no big loss. However, I am keeping the siding to the warehouse at Burnside wharf for the extra switching opportunities. I haven't decided on whether to do a swing section or removable piece for access to my office. I am leaning to a swing section, while Alicia thinks a removable piece is better. I did a bit of surveying tonight and may have to put a slight grade on the line to provide sufficient clearance under the stairs, but there is room for that, so it shouldn't be a problem. The more I look at this plan the more I like it. However, there are few other ideas I want to explore, so this is not a final plan yet (it never is). I prefer to keep tracks out of the office because I want to build some nice book shelves in there and I like how the sky board came out in the far corner. But there some variants of v19 that I want to consider even though they do invade the home office. Hope you have a Merry Christmas. I am off to Rochester, Minnesota. I will be presenting a talk to the Mayo Clinic Charter House on Thursday on Railroads of the Civil War. While I'm gone take a look at a tweaked version of V18. I opened up the aisles a bit and shortened the Falmouth peninsula to make access easier by the choke point. Now there are nearly four feet or greater aisles at almost all points without sacrificing 10 car trains with a 36 inch minimum radius. I also added a continuous run (CR) track across the bottom of the new peninsula. I am really ambivalent about having a CR, but it does add two additional spurs that can be worked in an op session. However, the idea of having to disguise the holes into backdrop really turns me off. The next bugaboo was the swing section on the office door. I examined the door more closely to determine how it could be built as a swing gate. I concluded that building a swing section with a sky board attached to the door would work very well. This is a case where the low ceiling actually helps, see the photo at the left. Note the low ceiling over Andy's and Tom head (yes, Tom is smiling). I would put a sky board right on the door and paint the corresponding trim molding a sky color. One thing I really like about this plan is that it provides a new job on the Aquia Line to replace the lost jobs of PoLA. The new job would be the Burnside Wharf switcher. That job would work like a short branch line out of the Aquia Landing yard, which it was in reality. 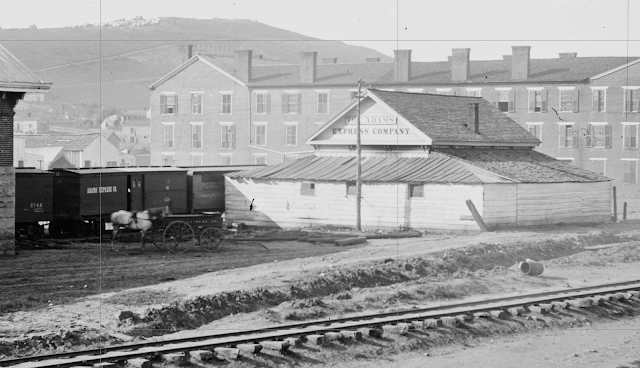 The Burnside Wharf crew would work the sidings on the Burnside wharf and on the new warehouse. It would reduce the switching of the road crews a little, but they seem busy enough already, especially with having to switch the car float. Overall, this plan solves the cramped Falmouth problem, adds a job to replace the loss of PoLA, and provides a longer siding at Falmouth so that the railroad can handle 10-car trains. It also leaves a lot of aisle space for visitors and operators. Furthermore, it makes taking photos of Aquia Landing easier, as there will be continuous backdrop behind it when shooting across the wharf to south. Finally, it isolates the operators at Aquia Landing from Falmouth, hopefully increasing the feeling of distance. The sky board on the new peninsula would not extend to the ceiling, but only to the level of the window sill, which is about 6 ½ feet high. And then there are the ships. There would be room for Passaic and a large paddlewheel schooner, though I becoming convinced I should covert Passaic to a pond model. I could even add a Baltimore clipper, as you can see several of them in the prototype photos. ....It's looking like a win-win design. Steve Clarson asked if there was a plan 19? My answer was, "Of course." So without further ado, here it is. 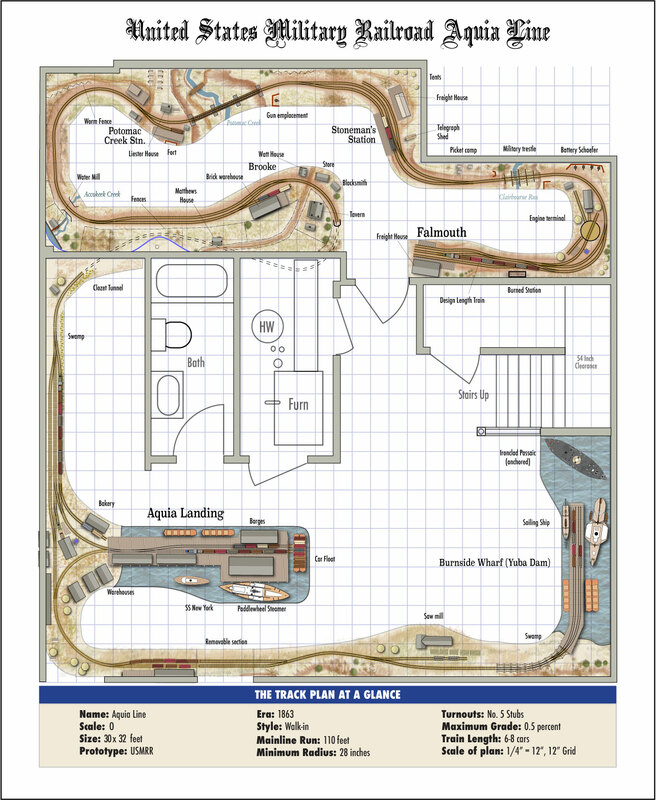 It takes plan 17 and expands it by moving Burnside Wharf into my home office. Turns out that my home office has two doors into it due to an earlier basement remodeling. Right now the former closet door is closed off. 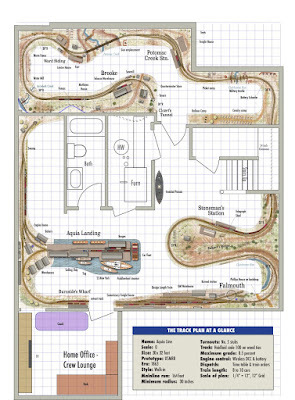 But it could be opened and a thin section of benchwork run-through it to allow Burnsides Wharf to be in my home office. I would have to do some reconfiguration of the desk and wall hangings in the office, but it could fit. In this version, I would no longer use the main door to the home office. Instead I would place the couch where it normally would open. Not ideal, but it would keep the other door more open. This plan could be built in stages. First the v17 peninsula and Falmouth could be built. When it is ready, I would remove the existing Falmouth and connect the new track under the stairs. Once that is all operational, the Burnside Wharf expansion could happen into the office. If I still want to keep building on this layout, I could rebuild the Potomac Creek bridge to make it full scale size. By then, I'd be ready for the old age home. A couple years ago I posted a summary of a typical day on the USMRR at this link A Day of Operation on the USMRR Aquia Line - 2 March 1863 Recently, I went through a few additional weeks of conductors reports not shown on that link and made this list of car contents. They are not in any order, but it shows the variety of loads carried on the USMRR Aquia Line. 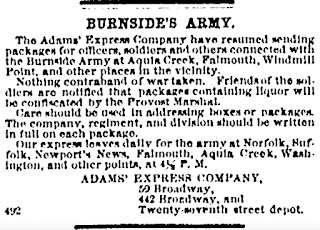 There was also some message traffic on special trains for Haupt, General Ingalls and General Burnside. I am also planning an Adams Express car to run with the mail and passenger car. The photos show two possible styles, though not on the Aquia Line. 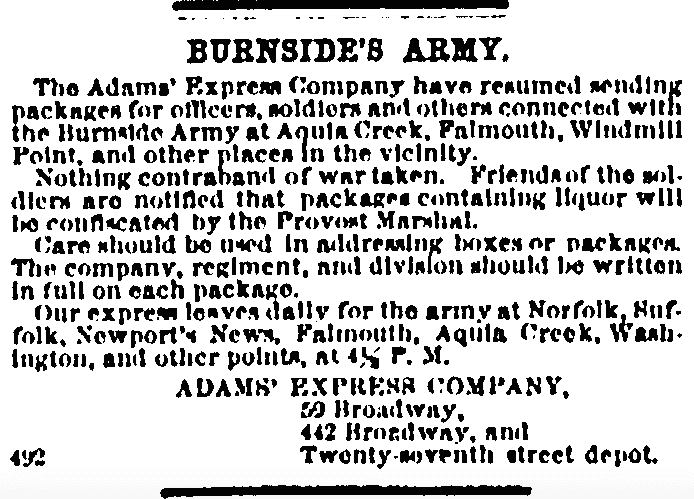 We do have some evidence that Adams Express operated on the Aquia line with offices at Falmouth and Aquia landing. They advertised in NY papers to families to send packages as this ad below shows. Yes, with the holiday season upon us, and the end of the year looming, it's time for model railroad Design Death Match 2017. In version, we will look at three four possible expansions of the Aquia Line. All of these designs entail dismantling the PoLA layout to provide room for even more Aquia Line layout. PoLA would be sold off or converted to modules. 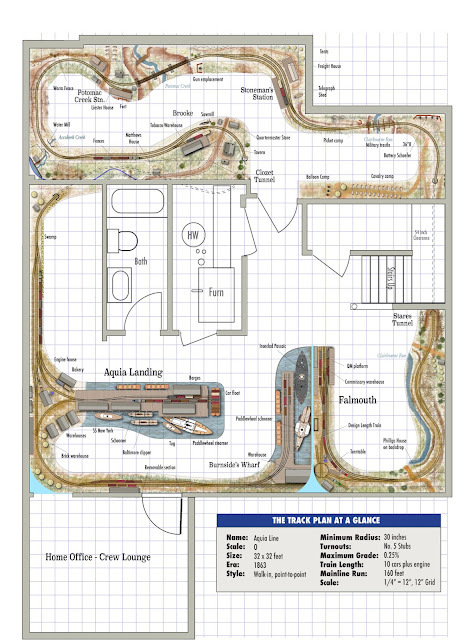 Version 11, the Burnside Wharf Expansion, you may have seen before, but this has been updated with the as-built configuration of Aquia Landing. 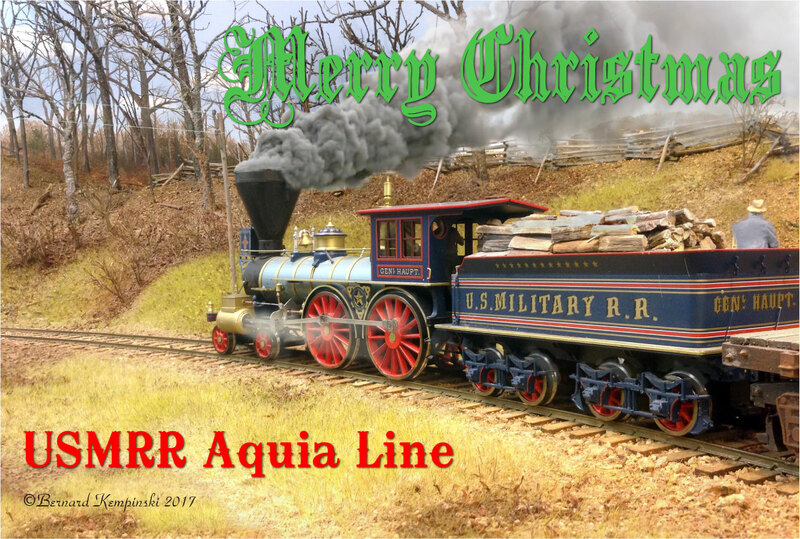 This version requires the least demolition of existing Aquia Line. It essentially replaces the current PoLA with an extension of Burnside Wharf. Currently, operations with limited Burnside Wharf are proving satisfying, so the main reason to do this would be to free up some space to have more ship models. It keeps the current crew lounge and TV viewing area. It has the drawback of a removable section across the door to the office. It is possible that in this version, an extra crew could be the Burnside Wharf switcher, running cars from Aquia Landing to Burnside and back. Version 15, the Small Falmouth extension, replaces PoLA with an extension of Falmouth. It would remove the tight curve that exists at Falmouth now. The overall length of run would also be expanded. 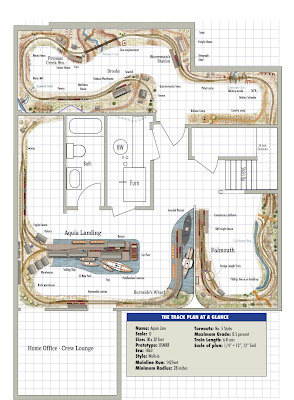 With more space to model Falmouth, the sidings can be longer allowing for 10 car trains. This version would keep the current crew lounge in the main layout space. This version also has a longer run with the track under the stairs compensating for the lost mainline on the current Falmouth. This would be called Stares Tunnel. There is a possibility of a connecting track for a continuous run for open house operations. Version 17, The Big Falmouth Extension, is similar to 15 in that Falmouth will be moved, but it includes a big peninsula in the open space. The peninsula will have a eye level ridge, called Robert's Ridge in honor of my father, down the spine to block the view. It is the most drastic and biggest expansion. By adding a large peninsula where the crew lounge is now, I would be able to move Stoneman's Station to that peninsula. I would also relocate Potomac Creek to where Stoneman's Station is now. That is a simple name change. The current Potomac Creek station would become Ward's Siding (named after the first U.S. Navy officer killed in the war at the Battle of Aquia Landing), a simple stub switch siding, or it could be removed. These changes would create a whole new station where 10-car trains could meet, and match the prototype station arrangement too (other than Ward's Siding). In Version 17 the crew lounge gets moved to my office space. I am planning on building new book shelves in my office anyway, and I will locate the TV there and build bookshelves to house it. I spend 75 percent of my basement time in my office, and rarely watch TV, so having the TV and more importantly the stereo, in my office would make it more useful to me. Version 17 has the longest mainline run. Other than running tracks into the office, it is the maximum run I can fit in the basement. Hold the presses, this just in, Version 18. It has the best of both designs 11 and 15. More mainline than 11 and more ships than 17. Operators at Falmouth and Aquia Landing would be isolated from each other. Could this be the one? My wife prefers the more open plans, but she is OK with any of these options. She said, "do what you want, I never go down there anyway." Now it's time for you to cast your vote or place your bets. Eight operators showed up today to run trains on the Aquia Line and PoLA. We had two first timers, Wes Morgenstern and Ed Kapuscinski, Sr. Wes has an WM based O scale layout that has some articulated engines that are as long as a whole train onto Aquia line. Ed K. Sr. and I first met over 20 years ago when doing NTRAK. I hadn't seen him in many years. Returning for duty were John Drye, Eric Payne, Jeff Peck, Ed Kapuscinski Jr., John King, and special surprise operator Phillip Hoffman, who was visiting from Louisiana. John King and Phillip volunteered for PoLA. 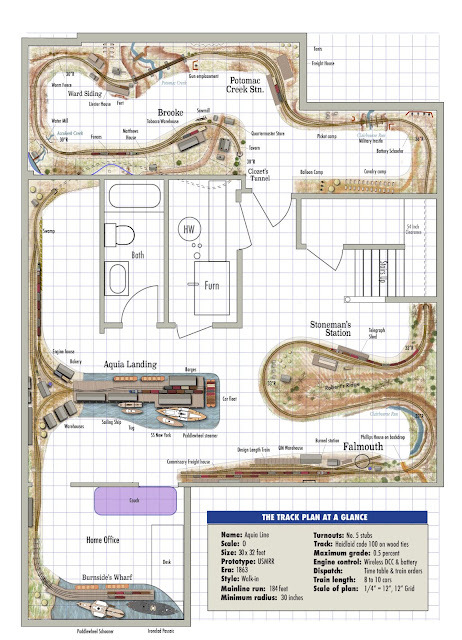 John decided to make a second switchlist based on his observations of the cars on the layout. I'm not sure why or what he did, but he seems to be happy in using it. Switching PoLA can be challenging, especially when you forget half your cars in the staging yard. Oh well, they got 'er done without mishap. We decided to run two 3-man crews on Aquia. John Drye conducted Train 7 out of Aquia with Jeff Peck as brakeman and Wes Morgenstern as engineer. Eric Payne was conductor on Train 8 out of Falmouth, with the Ed K's, junior and senior, as brakeman and engineer. Three man crews work well when we are only running two trains. Things ran very smoothly overall. There is a lot of assimilate when you first try the layout, so we expect operations to go even better as time goes on and the crews gain experience. The more experienced crews really can get the layout running smoothly. Here is a video summary of the day. At one point, a crew realized they misread the time table and went too far. Luckily there was no cornfield meet. So they flagged the on-coming train and waited it out in a siding. It was a simpler time then. This was the first session where we switched cars off the car float. There were four cars to pull. Train 7 and train 9 each got to pull two cars. We did not reload the car float during the session. With the car float in operation, we discussed the possibility of having an Aquia Landing wharf switcher that would just handle that job. It will be something we consider as we do more ops sessions. I installed a small shelf in Falmouth for conductors to use based on a recommendation by Eric Payne. Hence, it is now the Eric Payne Memorial Shelf. Alas, the crews seemed to not use it as the aisle to it is blocked when other crew men are standing there. Perhaps with two-man crews the shelf will prove more useful. It is a great place to place a drink. Phillip got to run the General's special right at the end of the session. One of the pleasant surprises is how interesting and challenging the operations on the Aquia Line have been, despite the relatively simple track plan and low train density. It was a factor that concerned me as I was building. I am so relieved to see my operators are enjoying it. I love watching the crews interact as they discuss what they will do. The operations really brings the layout alive. After the op session about a dozen or so visitors showed up for a layout open house. They included Adam, Alexander and Estevan Talaber, Ed Keating, David, Emily, and Moly Mosher, and Emily's boyfriend, Bill, Tom Pierpoint, Mark Andersen, his girlfriend Betty, Doug Gurin, and Paul Dolkos. The children got to run trains on PoLA and Aquia Line, whereupon they did quite well and with enthusiasm. We can't forget that Alicia made some good snacks for everyone to enjoy. All in all a very fun day. Here is a short video taken by Phil, for a different take on the day.. The newly cut waterline hull alongside the wharf at Aquia Landing. It's hard to photograph as it is so big. Tonight, I glued in the plywood deck to the styrene hull. I used a combination of CAA and Wellbond. Before I did that, I reinforced the area of the hull where the deck meets the hull sides with a strip on 1/8th by ¼ inch basswood. The area near the paddlewheel in particular needed some stiffening. Once the CAA glue had a few minutes to set, I marked the waterline using various thickness boards to get the hull at the right attitude with respect to the nearly flat bottom keel. The deck at the bow is about 1/8th inch higher than the stern. Before cutting, I double checked the dimensions along the hull with my calipers. I needed to re-mark one side. It was easy to wipe off the incorrect line with an alcohol soaked rag and then carefully redraw it. With both waterlines the same, I then used a utility knife to cut the styrene hull along the marked line. I made multiple light passes with the blade and eventually the styrene snapped open. I actually had to change blades as the knife edge quickly wore away. With the bottom cut off, I had access to the interior. I ran a thick bead of Wellbond along the deck hull joint. Tomorrow I'll add some lateral stiffeners inside the hull, but I was pleasantly surprised at how sturdy the hull was even now without them. Then I 'll sand the cut edges and get it all squared up. This was the toughest part of building this model. The rest of the ship is not much different than building a land structure. Using the styrene hull saved a lot of time. So far I've worked on this hull about 4 hours and it is nearly done. If I had cut my own bulkheads and planked them, it probably would have taken me about 30-40 hours of work. It really looks cool sitting alongside the wharf as it dwarfs the trains near it. So it begins. After sitting for seven years in a box under the benchwork at Aquia Landing, I finally started building the Mt Washington. I purchased this kit from Dumas Models in the fall of 2010, see this blog post. This is a large paddle wheel steamer that may well be the crown jewel at Aquia Landing. It is craftsman style kit intended for radio control (R/C) use on ponds. Internet reviews of the kit from R/C oriented modelers say that it is not a great pond boat as it is top heavy and unstable. Many of the folks that run the model on water use detachable keels with ballast. Most of them opine that it is better suited as a display model. To further scare off modelers, the instructions say to devote 9 months to constructing it. Whew, that is scary. Fortunately, I do not intend to make it a pond model. In fact. I will cut it at the waterline like I did to the Deans Marine Danica Marie R/C conversion I did for the PoLA layout. Having built a Dumas kit in the past, I know that the construction techniques they recommend are overly complicated with the aim of providing ample room in the hull for R/C electronics. They also have to design the kit to allow the topsides to be removable and watertight to allow access to the mechanisms. The kit instructions come in three booklets, with text in one, drawings in another, and photos in a third. There is a lot of head scratching as you read textual descriptions of parts without a drawing nearby to look at. You end up flipping between the booklets as you read through them. To further confuse the instructions, the drawings are not numbered in the sequence they are called out in the instructions. So I plan to essentially ignore the kit instructions and treat the top side as a scratch build project. Another time consuming aspect of the kit is the cutting of the windows on the main deck and the vents on the waterwheel housing from the supplied vacuum formed parts. I will use my laser cutter to make these parts more accurately and faster than by hand. The kit comes with a lot of die cut frames for the decks. I don't plan to use any of them. I will laser cut the superstructure using the plans as a guide. In effect, I treat the kit as a vacuum formed hull that came with a set of detail parts and lots of strip wood and styrene. I find that when trying to build ships that are correct for my era and locale, it is more cost effective to buy a kit that is close to the desired model, and then use it as a consoldiated source of raw materials. When you go to buy individual detail parts the cost adds up very quickly. The savings can be enhanced if you get the base model on sale, like I did with this kit. The first step was to trim the excess plastic lip around the vacuum formed hull. This model has a styrene hull and it is easy to cut with a hobby knife. Once the lip was mostly removed, I was relieved to find that the beam is about 4 inches less. The narrower hull fits in my harbor scene much better and it looks much more streamlined too. Next, I used the drawing in the kit to cut a single piece of plywood to make the main deck. Here again, if you follow the instructions, you will be gluing dozens of pieces together to make a two-piece removable deck and super structure. I plan to use the deck like I would a foundation on a ground structure and add the superstructure to it. Only a small portion of this deck is visible near the bow and the stern. I will plank those with a layer of laser cut basswood. Tomorrow I'll add braces to the interior and glue the deck. Then I cut it at the waterline, and add any necessary braces from the inside. Stay tuned as I hope this will be fun. I was unable to find any prototype photos of the transfer bridge at Aquia Landing. The photo at the left the shows the end of the wharf where the transfer bridge should be, but the transfer bridge is not visible. It may be obscured by the railcars, or it may not be present. The photos do show clearly that there are two tracks on the wharf. With no prototype photo of the actual transfer bridge to guide me, I made a two-track transfer bridge using the photos from similar facilities at Alexandria and City Point as a guide. 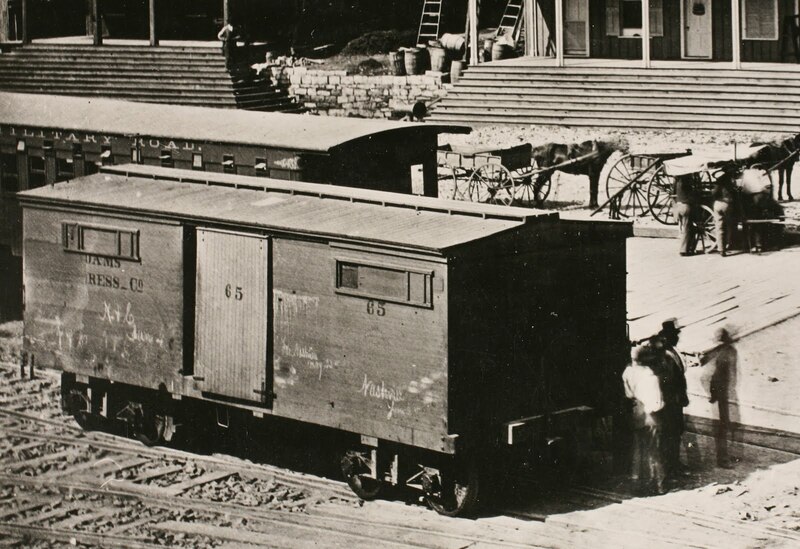 There was also a transfer bridge at Manchester, VA at the end of the war, but that one was much different from the other two and was used to load cars to ships as cargo and not on rails. Overall, I based my transfer bridge on the structure at Alexandria, but with 2 vice 3 tracks. But I used the block and tackles from the City Point transfer bridge instead of the lever arms of the Alexandria facility. The model blocks and tackle are home made and they actually work, though the blocks will break if you tug the lines too hard. I broke three in the construction process. The biggest difficulty with this project was the track spacing. I set it 2.63 inches to allow 8 cars on the float track. But that made for a very tight clearance for the central post of the transfer bridge gallows. It took some careful work to provide clearance for the post and lifting ropes. In retrospect, I should have made the tracks about 2.75 or 2.8 inches apart. I can shift the barge to load each track. I am not sure I will do that in op session. But I can do it for photos. 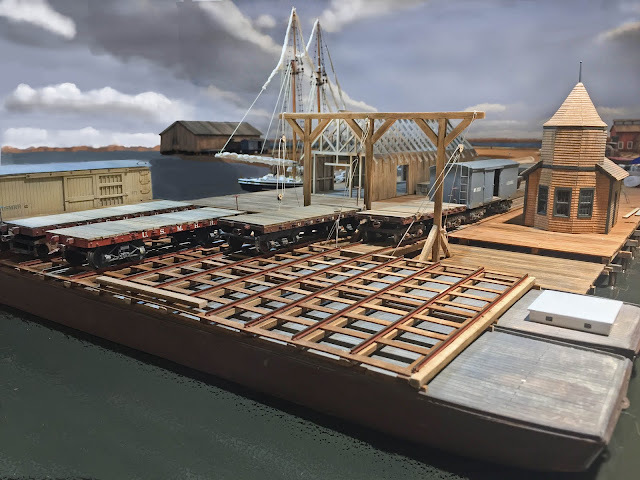 A few more details on the barges and this project will be wrapped up. 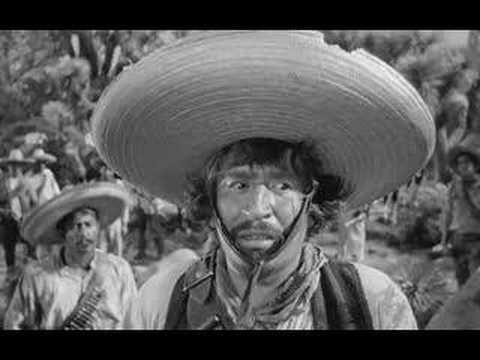 What, he said, "badges?" Oh, OK, never mind. I have been working on the barges for the car ferry this week. I have the basic hulls done, including the frame work to support the rails. I'm in the process of adding the final details. Once the barges are done, I'll build the transfer bridge. The USMRR had several sets of rail transfer barges. 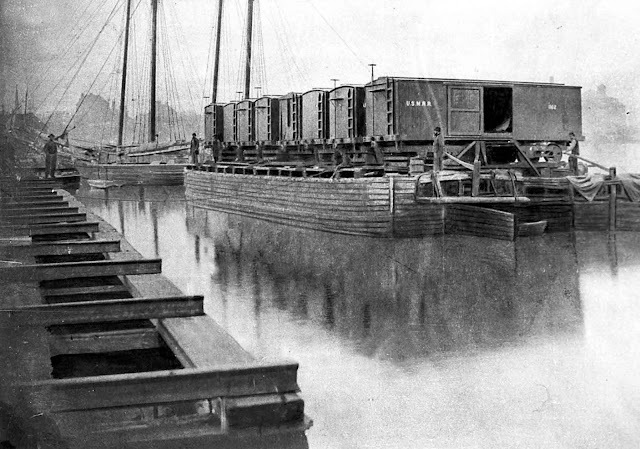 Most appear to have numbers instead of names, but in photos names on several barges can be seen. So I named mine after my mother and mother-in-law. The transfer bridge will be about 4 inches long. I still need to add some detail parts to the bow area. The rails on the barges ride a little taller than the rails on the wharf. So there will be a slight incline up to the barge from the wharf. This is not un-prototypical. The tide at Aquia Landing is about 1 foot under normal non-flood conditions. The transfer bridge is designed to move up and down to accommodate the tides. The slight up ramp might help prevent cars from running off the floats. We'll see.